Left hotel and drove to the Church of Santa Maria delle Grazie to see Leonardo da Vinci's "Last Supper" fresco on the wall in the adjoining former monastery. From Milan we headed for Venice going through Verona and Padova [Padua in English]. At Padova we stopped for a bite - had pizza pie with sardines in it and then went on to Venice. Parked car at garage and then caught motor ferry to hotel. Venice is high [in prices] but we have a waterfront room and it is really nice. * After dinner, had wine with it, we took a gondola ride and walked through the square [the Piazza San Marco, St. Mark's Square]. * According to the "HOTELS STOPPED AT" section of the trip diary, my mother and her friends stayed at the Regina Hotel in Venice, Italy. 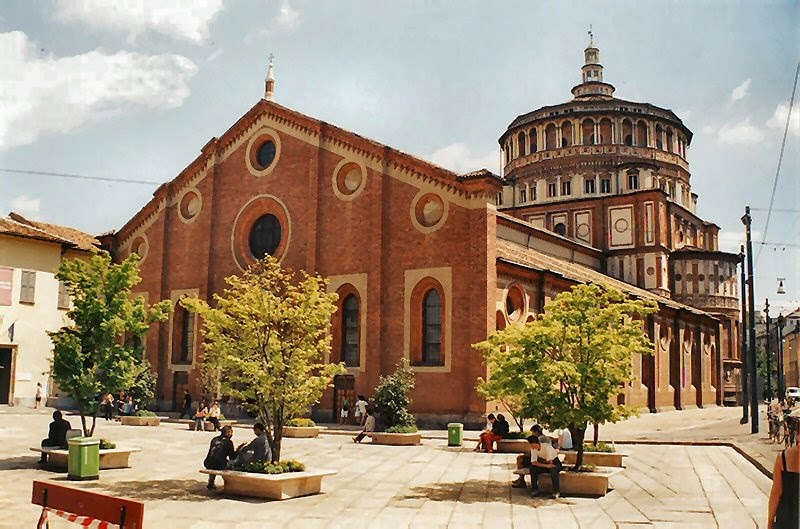 Below is a photo of Santa Maria delle Grazie (Holy Mary of Grace). The 1460-built convent of the church was bombed in 1943 during World War II, but the wall with da Vinci's Last Supper had been sandbagged and survived the destruction. The painting underwent a restoration in 1947-49 and 1951-54, so Mom may have witnessed some of the latter work. 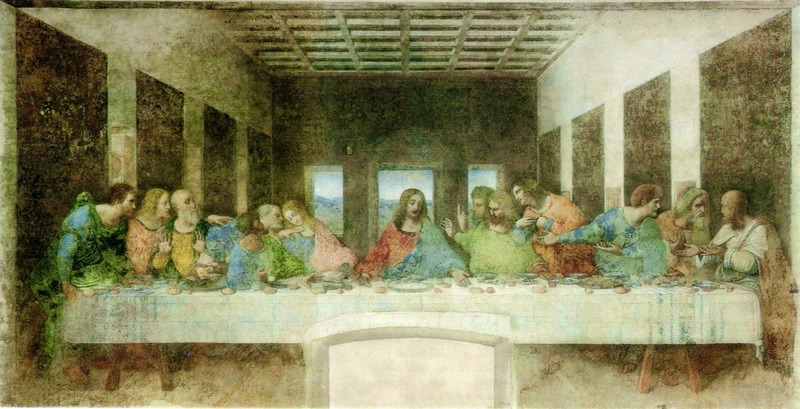 The Last Supper, by Leonardo da Vinci [Public domain], via Wikimedia Commons. This photograph of the artwork was taken sometime before 9 December 2004, but after the 21-year restoration was completed in 1999. 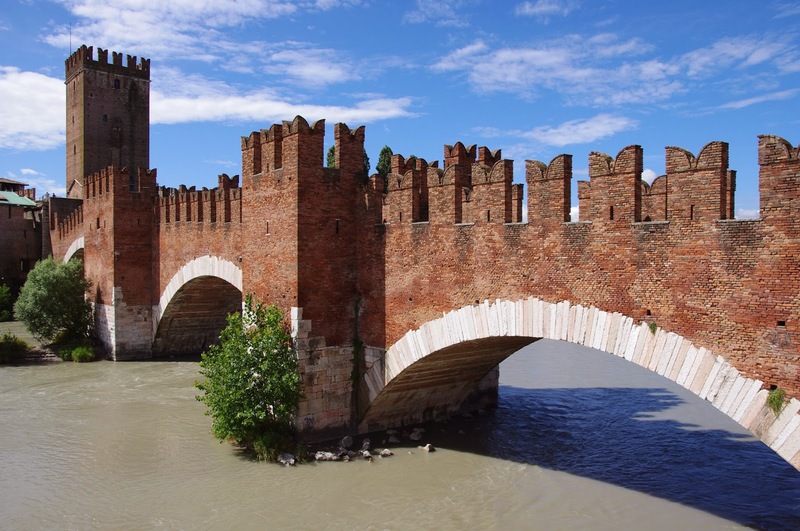 Above is a photo of something Mom might have seen in Verona, the Ponte Scaligero (or Ponte Castelvecchio), a fortified bridge over the Adige River constructed in the 1300s that had the world's largest span (48.7 meters) at the time of its construction. The bridge was destroyed by retreating German troops in April 1945 near the end of World War II; however, reconstruction was completed in 1951. 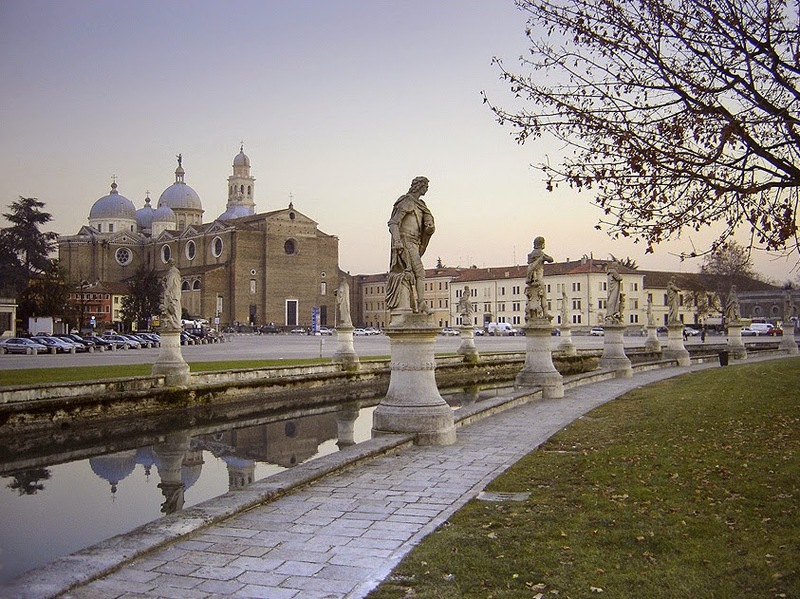 In Padua, Mom probably saw the famous Prato della Valle (pictured below), a large elliptical park in the center of town with a small canal around it that is lined with a total of 78 statues. Note the odd detour in the map above of this day's travels, from Padua to Venice. This will be explained in a future trip diary entry. More about the Regina Hotel and Venice in tomorrow's post. This is the 48th in a series of posts transcribing entries in my mother's 1953 Europe Trip journal. I came in late but I think I've caught up and I'm SO enjoying this trip!! Thanks, Laura, and thanks for commenting! It has been fun for me too.